Wokai, which funded microloans in China, is closing down. According to the announcement Wokai did not succeed in finding a new CEO. Read earlier articles on Wokai’s launch in 2008. As last year I’ll again attempt some predictions on what trends and developments can be expected in peer-to-peer lending 2009. In many markets multiple p2p lending services will compete for the attention of lenders and borrowers. In other markets, where there is no national p2p lending service active yet (e.g. Canada, New Zealand), p2p lending will be introduced by the launch of a service. Possible candidates include Communitylend and Nexx. It is hard to predict when the dormant US players (e.g. Prosper, Loanio) will overcome the regulatory hurdles and if that step is lasting. The British market which has (compared to other markets) rather low regulatory barriers so far is dominated by a single player – Zopa. I wonder if we’ll see the launch of a competitor there. 2008 saw the launch of Babyloan, Veecus and Wokai. Kiva funded more the 1 million US$ new loans in a single week in the end of December. The steep growth of Kiva, MyC4 and other services will continue and new p2p microfinance platforms will launch. While p2p lending volumes are far from being a business threat to banks – banks do watch the developments. 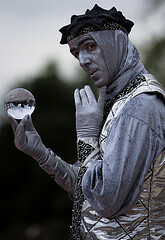 Possibly in 2009 a bank will launch its own p2p lending application. The principal aim will not be to generate revenue, but rather to collect experience and to gauge acceptance by the bank’s customers. It will be interesting to see banks testing the water on their path to implement a p2p lending concept that supplements their core business. Wokai.org launched today. Wokai allows contributers to aid small entrepreneurs in China through microfinance. A month ago I wrote a preview about Wokai. We are delighted to report that Wokai.org is now live! Just two years ago, we were students in Beijing, dreaming about starting a microfinance organization. Now, thanks to our advisors, chapters, designers, donors, families, field partners, friends, interns, investment committee, lawyers, pilot participants, programmers, volunteers and so many more, this idea has transformed into a dynamic international organization with an amazing website, to empower people in China to lift themselves from poverty. We needed you and you were there, and for this we can’t thank you enough. Over the next two years, 44OO families from all across rural China will receive loans through Wokai. These loans will enable people to start and grow businesses in their communities. With the proceeds, they will send their children to school, and invest in their housing and health and brighter futures. 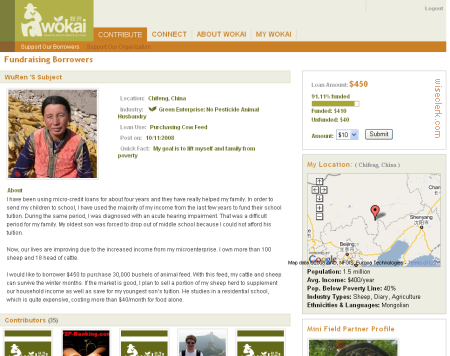 Non profit Wokai.org will allow contributers to donate to give microfinance loans to borrowers in China. Like Kiva and MyC4, Wokai partners with local MFIs which identify and screen potential microentrepreneur clients. Selected clients are then posted on the Wokai website through profiles that outline their business ventures and loan request. Contributers can select borrowers to fund and pay via Google Checkout, the money is then transferred to the MFI who disperse the capital to the microentrepreneurs. Field partners charge interest rates typically ranging from 8-20% to cover the high costs associated with providing loans, training, monitoring and support services to our borrowers. At the end of the loan-cycle the money is collected and re-issued by the MFI for new loans – so there is no payback to the contributers. See this video for a good overview on Wokai. The name “Wokai” means “I start” in Chinese. Wokai has not launched yet, but I could participate in a pre-launch test drive. The platform has more social networking features then other platforms allowing for discussions and users asking questions to the MFIs/borrowers. Wokai began in the fall of 2006 when Wokai co-founders Courtney McColgan and Casey Wilson met while studying advanced Chinese at Tsinghua University. The idea of Wokai gradually transformed into a plan of action and, with the help of a team of supporters, evolved into a startup nonprofit.